The Lie-Nielsen Small Chisel Plane (97 ½) is something that never fails to catch attention. This is likely in some part due to a unique design with the cutting edge of the iron at the very front of the plane. That’s right, there is absolutely no toe section out in front of the iron, as is common for most types of planes. While this might seem like a deficiency, and could cause definite problems for a multitude of operations on most planes, the function of the 97 ½ is anything but ordinary. The length of the plane is 6 ½”, width is 1 ¾” , and the A2 tool steel iron is a hefty 3/16” thick by 1 ¾” wide. The iron is bedded at 12-degrees, so it falls into the category of low-angled planes. The cap and body of the 97 ½ are Bronze, increasing the plane’s heft, as well as eliminating the issue of rust (bronze can still oxidize, so light oil protection is useful) on the plane. Add on the rich hues from the Cherry knob and it is one beautiful plane. The plane weighs in at 2.35 lbs, which feels as if it’s dialed in perfectly; not too heavy nor too light. The iron comes from the Toolworks with a 25-degree bevel and I hone it with a 10-degree micro-bevel, raising the overall angle on the iron to 35-degrees. The honing process I use is exactly the same as for almost every other plane iron, and since I’ve covered this in previous articles which are on this blog, I won’t repeat it here. If you would rather watch a video on sharpening, check out Lie-Nielsen’s Youtube channel for a great video. After the iron is honed and on the plane’s body, rotate the cap’s screw until you feel resistance, and then add ½ turn to snug it up. To set the plane’s iron to the proper cutting depth, back off on the cap screw ¼ turn, and while moving the plane forward slowly across a flat piece of wood, rotate the blade adjuster clockwise slowly until the blade just starts to grab the wood. If the iron is hitting on only one corner, gently tap the blade until it is square to the plane body. While applying a slight forward pressure on the plane, start rotating the blade adjuster counter-clockwise slowly, just until the plane moves forward without the iron grabbing the wood. Now re-tighten the cap the ¼ turn removed earlier, and then take up the backlash of the blade adjuster until you just feel tension. The plane is now set to remove material flush with the wood on which it is riding. Remember, since this plane has no toe section in front of the iron, you don’t want to set it so the iron is below the plane’s sole, like is normal for other planes. The design of the 97 ½ essentially creates a paring chisel with superior depth control, and no handle that hangs down to limit it’s reach. In this vein, it is very useful when working to clean up a dried glue line between boards or panels, resulting in a level surface. Similarly, the 97 ½ can easily trim protruding thin wood banding, dowels, screw plugs, through tenons, proud dovetails, …ending with each type flush to the surface. Rabbets are occasionally a bit rough straight from the machine or plane, and with this plane you can quickly make them perfect. Another technique in this plane’s wheelhouse is cleaning up the surface of a board, up against a mating board. For example, like cleaning up the interior horizontal surface of a box, where it intersects with the sides of the box. This is assuming the corners of the box are 90-degrees. Remember, this plane, like most paring chisels, works most effectively as well as leaves the best surface, when used while moving the cutter in a slight arc. This shearing cut can greatly reduce the chance of some operations to cause some blowout. I hope you’ll give this plane a try, as I believe you’ll find yourself reaching for it on a regular basis, once its in your toolbox. I’m sure you will likely come up with even more uses for this plane in your work, as I just shared some obvious uses. 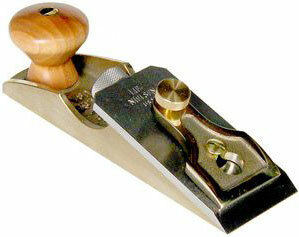 You can find out more information and purchase the Lie-Nielsen Small Chisel Plane from Highland Woodworking HERE.